The Sentry 4L3010 4 drawer fire and impact resistant lateral file cabinet comes with plenty of storage for your important files. 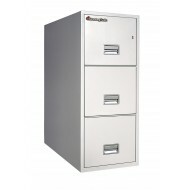 The file cabinet can be configured to hold either legal or letter size files. Rugged suspension ensures easy to open and close drawers. 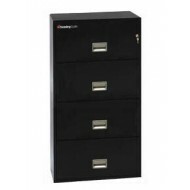 Sentry 4-Drawer Lateral Fire File provides filing for letter and legal size documents. Standard accessories allow front to back filing of legal or letter-size hanging folders or side-to-side filing of legal-size hanging folders.With plenty of room for storage and great fire protection, this is an excellent choice for your office. This product has been discontinued stock status can no longer be guaranteed, please see substitution products on FireSafeStore.com. Call us if you have questions. 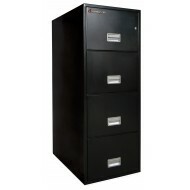 The Sentry 2G2500 fire rated file cabinet is a two drawer vertical file. The fire protection comes certified by UL, Underwriters laboratory which tested this model at 1700F. After one hour the interior remained at or below a temperature of 350F. Because this is a shorter but strong file, you can use the top for other office equipment such as a fax. The 3T3131 vertical file has all the advantages of the 4T3131 but is a three drawer file. The drawers are very deep at 31 inches and can hold many documents of letter size. 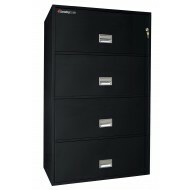 The 3T3131 vertical file with the triple protection: fire, water and impact. 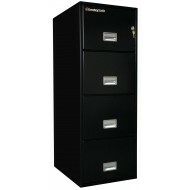 In other words, this is a UL rated fire and impact file cabinet and an ETL rated water resistant file cabinet. The 3T3131 is set up to accommodate letter size hanging files. Included with the 3T3131 is a free digital media chest when you order. Protect hard drives, discs, tapes, memory sticks, and other digital media in this 1/2 hour fire rated case! The Sentry 4T2510 is a sturdy four drawer file cabinet. . Each drawer has a rugged suspension system to make opening and closing drawers easy. It has UL 1 hour fire protection and impact resistance in case a floor burns out from under it. It comes with a plunger key lock and also the lock/unlock system which allows you to keep one drawer open and the others locked. Although this is a 3 drawer file cabinet, the 3T3100 is deep which gives it extra capacity. 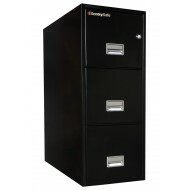 This fire file cabinet is designed to hold letter size documents. The Sentry 3T3100 carries a UL 1 hour fire protection label. The rugged suspension construction allows the drawers to move easily even when fully loaded. The Sentry 4G2500 vertical file cabinet offers 1 hour fire protection for contents. This is certified by UL, Underwriters Laboratory, and independent laboratory. With rugged suspension, the drawers open and close easily even when fully loaded. 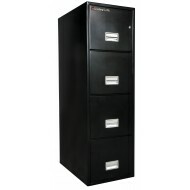 This fire rated file cabinet can be used to store both legal and letter sized documents. 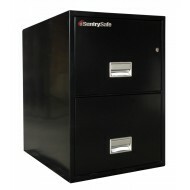 This is a very large Sentry fire rated file cabinet with plenty of storage. The Sentry 4L3610 can accommodates either legal or letter sized documents. The drawers slide easily even when fully loaded due to the rugged suspension system. 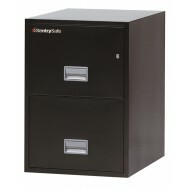 The Sentry file cabinet has both a UL one hour fire rating and a UL impact rating. Sentry (formerly Schwab) Brand fireproof cabinets offer a pleasing design with recessed handles, and the highest quality construction. 31" Vertical file cabinets are the deepest available and are also the most popular size of fire file. All Sentry fireproof file cabinets will protect your documents from: Heat, Fire, and Smoke Water damage from fire hoses and sprinklers.